Some weeks ago, we released the new Smart Compare feature, an effective way to compare cloud costs of various months with each other. Now the existing CSV-export functionality is able to export these important results of Smart Compare as well. This enables everyone to find and report cost spikes fast and reliable. Many team administrators would like to know, if the team members are taking their responsibility for specific subscriptions. Now administrators can see the Last Login information in the Manage Team overview, what gives helpful information if team members are checking cost reports on a regular basis. All new features can be used right now as part of every plan. Try the new features today by simply logging into your azure costs portal. The azure costs team is pleased to announce the support of more payment options, which goes live today. From now on, you are able to pay with all major credit cards, e.g. Visa, MasterCard or American Express. In addition we support Paypal as a very comfortable way to pay as well. The payment is processed from our partner FastSpring who is one of the most reliable and successful payment providers in the world. You stay in control and can upgrade or terminate your subscription at any time directly in our billing portal or in your FastSpring account. Thanks to your feedback, we were able to constanly improve the Azure Costs user interface in the last weeks and months. One special hint we got from you, was the fact that it sometimes can be pretty confusing, when it comes to multiple Microsoft and Azure Active Directory accounts. From now on, you’ll get the mail address that was used for logging into Azure Costs, whenever you move your mouse cursor over the avatar. This ensures, that you’ll never be confused anymore about different accounts or dashboards without data. Try the new feature today by simply logging into your azure costs service and move the mouse cursor over your avatar. The feature is part of plan it doesn’t matter if you are using the Basic, Professional or Enterprise plan. We feel very fortunate to have engaged users who tell us about their cloud data management challenges and the functionality that they’d like to see added to azure costs. And we listen. With the new export functionality our users are able to export their spending data to a CSV format. In addition, they can control the export to show more or less detailed data by applying the azure cost filter- and grouping functionalities. This enables every user to export just the right granularity of information and to satisfy all stakeholders in the company. Interested in the new export feature? Try the new feature today by simply logging into your azure costs account. The feature is part of any plan, starting from the free Basic plan up to the Enterprise plan. The azure costs team is pleased to announce the launch of their newly designed Web site, which goes live today, and is located at the same address: https://azure-costs.com/. We know that landing pages are very important, so we have decided to totally re-design and re-organise ours. Our new landing page now displays all important information like features, purchase- and pricing information, screenshots, a contact form and log-in possibilities. The new site design, aside from being aesthetically pleasing, is more agile, interactive, and is easier to scan, read and navigate. It is using a responsive design, which means that you’ll see essentially the same design optimized for your smart phone, tablet and Desktop. We hope you will visit the new website at https://azure-costs.com/ and acquaint yourself with the new design. And while you’re there, don’t hesitate and let us know what you think by leaving a message. In the coming months, we hope to continue improving the site, so that it best serves all of your Azure cloud cost monitoring needs. 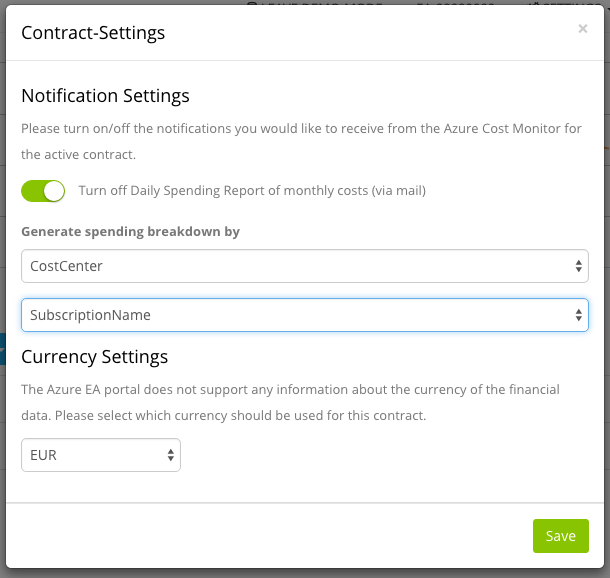 The azure cost monitor team is pleased to announce the launch of the extended breakdown options in the Daily Spending Reports. 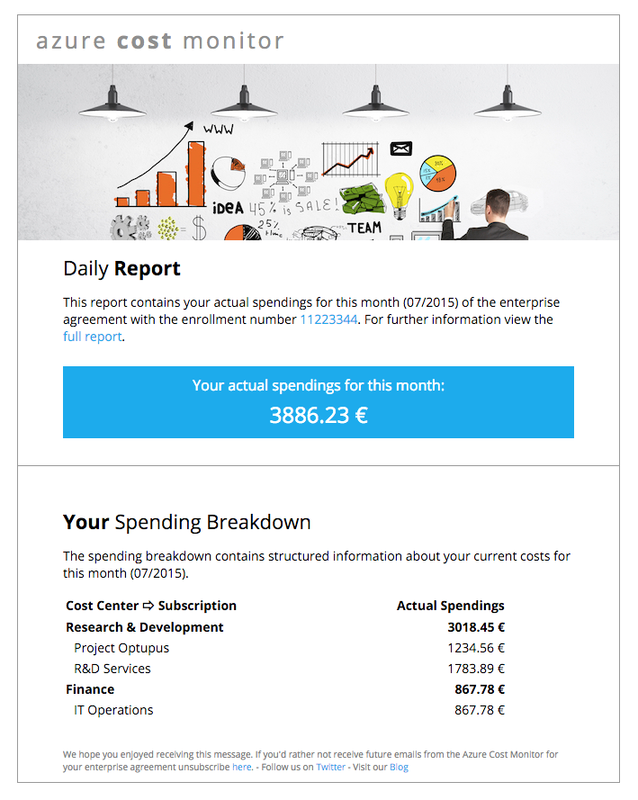 The spending breakdown is part of your daily spending reports automatically. So no further actions are required to get a crisp overview about your daily spendings. The settings concerning the daily spending report can be adapted in the settings of the contract in the navigation bar. Interested in the extended spending breakdown options? Getting a displayed number in the daily report isn’t always enough. For staying up to date on a daily basis concerning Azure spendings it’s way better to have a subscription breakdown available which helps to identify the biggest cost drivers or to oversee unplanned spikes. So the Azure Cost Monitor Team is very pleased to announce the support for subscription breakdowns in the daily spending report, starting today. 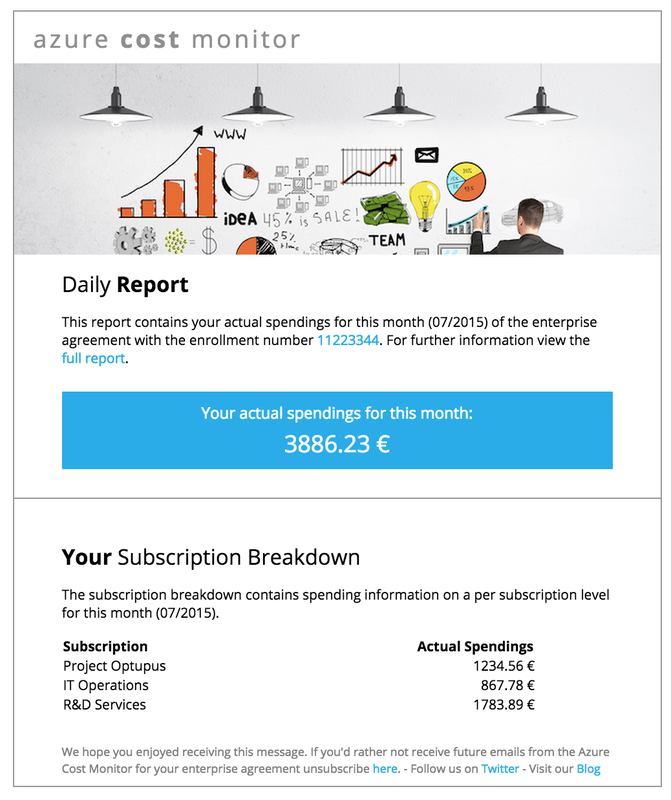 The subscription breakdown is part of your daily spending reports automatically. So no further actions are required to get a great overview about your daily spendings. As usual, settings concerning the daily spending report can be adapted in the settings of the contract in the navigation bar.